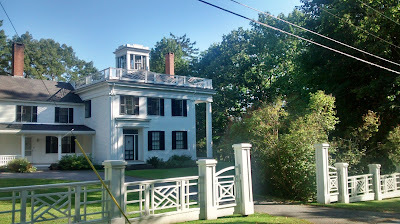 A beautiful Greek Revival house,"Riverside" was built c.1840 on ancestral land, for the Glidden family of Newcastle, Maine, owners of an ocean sailing fleet of clipper ships. 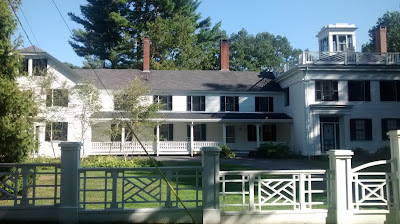 Always a pleasure to see this level of architectural integrity---the house is maintained with perfect pitch, ever more rare as changing tastes, the current trend toward heavy-handed 'improvement', and modern building conventions slowly eat away at these beautiful structures. 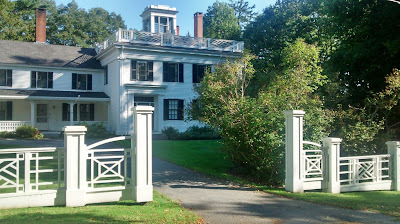 This is the architectural heritage--and streetscape---of Maine at its best. 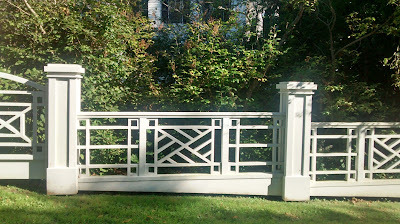 The design of the fence itself is based plate 33 in Asher Benjamin's Modern Carpenter, the source of many a 19th century New England builder's inspiration and instruction. Street view photographs by the Dilettante via phone, portico view via Creative Commons by Taorob, whose Panoramio site of photographs of Maine Architecture is a must-visit. This Newcastle house is particularly attractive, with its wooden fence. I never could figure out why people would buy significant old houses if they do not wish them to be evocative of the past. Does the columned side face anything in particular? 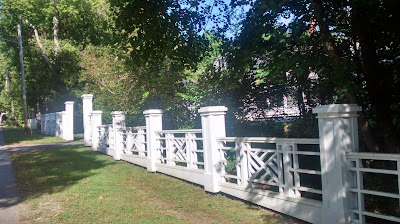 In the old photographs that I seek out, one of the advantages is that the more ephemeral architectural features like fences, porches, and balustrades are often shown in their original configurations. Oh i'm all about that fence - so interesting! My guess is that the name "Riverside" is a hint to column question. 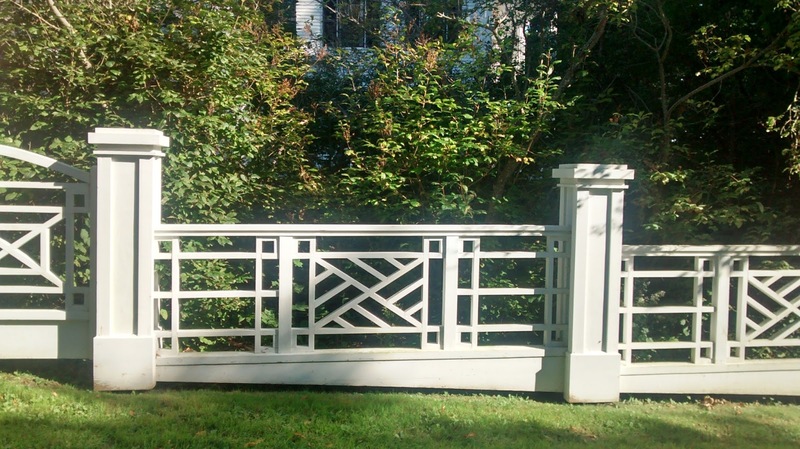 Thought I'd seen it all in the realm of American fences and gates, but this example was a genuine surprise. 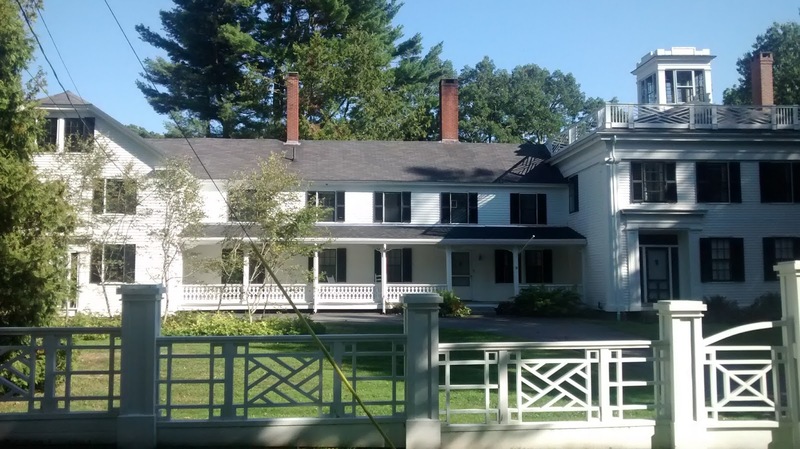 Was the fence contemporary with the 1840s house, or a later introduction? Not that dates matter when something is so very styish! Great Pictures...I can't believe that people live like that! شركة نقل عفش بالمدينة المنورة"
تنظيف الخزانات فى المدينة المنورة"
"تسوق اون لاين من خلال موقع بوروروم أكبر موقع للتسوق و إكتشف أفضل العروض.تمتع بخصم يصل الى 70% على العديد من المنتجات والماركات العالمية. وإدفع نقدا عند التسليم! I think this is a real great blog post. Really thank you! Fantastic.